With small businesses online needs expanding in this age of I-Pads and Facebook, we decided to bundle all the solutions that we used to add on to other packages piece-meal into one all inclusive discount package. 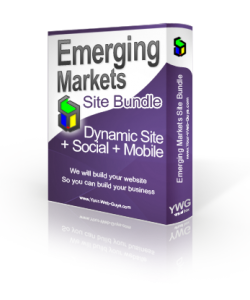 This package includes all the tools a small business needs to make a cohesive brand across all of the cutting edge technologies that are available today. The first website was published twenty years ago yesterday and boy have we come a long way in a very short time. New web standards like html5 are replacing things like flash and new technologies are causing us in the web design world to rethink the way we do things. The emergence of powerful scripting languages like PHP and the use of databases such as MySql have given us the ability to offer easy to use solutions to our clients. The Blogosphere: We have all heard of it and now this package automatically includes a blog of your own and the support you need to make it effective. Facebook Page: Most of the large companies you can think of not only have a page on Facebook, but a customized, brand heavy presence that caters to Facebook users and their wants and needs, now you can too. Twitter Page: Again, most large companies have Twitter accounts that are customized to help with their brand consciousness, with this package you can too. YouTube Channel: YouTube is one of the most visited websites on the internet and if you dont have a channel that matches your branding on other outlets then you are missing out. With this package all you have to do is make the videos. I-Pad/I-Phones: Even though Android has made major inroads in the smartphone and tablet markets, Apple is still the leader overall. Unfortunately Apple products do not parse flash applications. We make sure that all of your marketing will be view-able by apple products even if they have flash applications on them normally. Mobile Websites: Smart phones can view a website like any computer can, but they are slightly slower and have a much smaller screen. Even smartphone users sometimes prefer a mobile version of your website so they can load the information they need quickly and without the normal clutter of a regular web page. We included a mobile version of your site to address this. Facebook Fan Gate: a Fan Gate is where you ask for a Facebook user to like your page before you give them exclusive content. With this package you can use this extremely effective marketing technique quickly and easily.